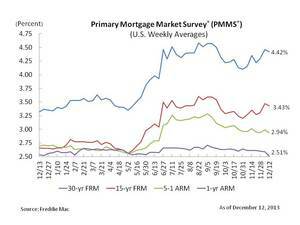 MCLEAN, VA--(Marketwired - Dec 12, 2013) - Freddie Mac (OTCQB: FMCC) today released the results of its Primary Mortgage Market Survey(R) (PMMS®), showing average fixed mortgage changing little from the previous week amid light economic data releases. 30-year fixed-rate mortgage (FRM) averaged 4.42 percent with an average 0.7 point for the week ending December 12, 2013, down from last week when it averaged 4.46 percent. A year ago at this time, the 30-year FRM averaged 3.32 percent. 15-year FRM this week averaged 3.43 percent with an average 0.7 point, down from last week when it averaged 3.47 percent. A year ago at this time, the 15-year FRM averaged 2.66 percent. 5-year Treasury-indexed hybrid adjustable-rate mortgage (ARM) averaged 2.94 percent this week with an average 0.4 point, down from last week when it averaged 2.99 percent. A year ago, the 5-year ARM averaged 2.70 percent. 1-year Treasury-indexed ARM averaged 2.51 percent this week with an average 0.4 point, down from last week when it averaged 2.59 percent. At this time last year, the 1-year ARM averaged 2.53 percent. "Mortgage rates were little changed amid a light week of economic data releases. Of the few releases, total nonfarm payroll employment rose by 203,000 in November and the unemployment rate declined to 7.0 percent. Also, single family mortgage debt outstanding increased for the first time since 2008. This is a positive sign as it reflects that the pick-up in new purchase-money originations has offset loan paydowns and led to a net increase in principal outstanding."